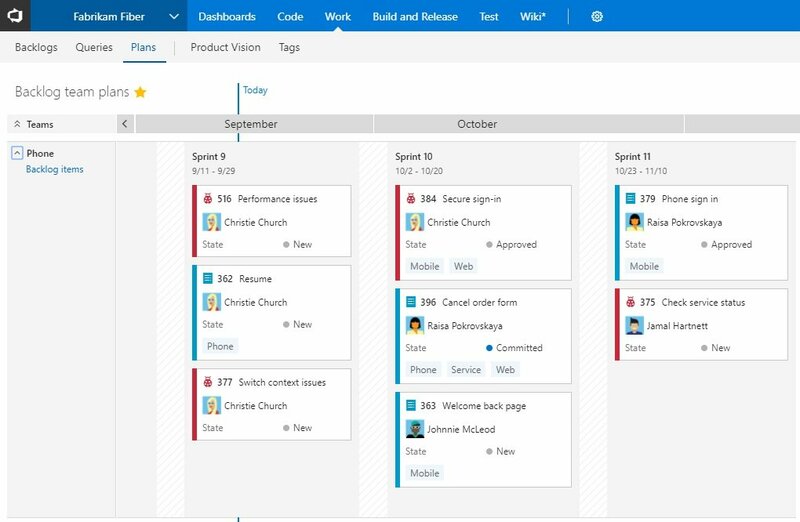 Visual Studio 2019 brings you the latest personal and team productivity features, support for modern development—whether that's .NET Core 3 (preview), cross-platform C++, or Xamarin—and innovations such as AI-assisted IntelliSense with Visual Studio IntelliCode or real-time collaborative development with Visual Studio Live Share. Looking for Visual Studio 2017 or 2015? For further information on Visual Studio 2019 & MSDN please call MicroWay on 1300 553 313 or email. Formerly known as Quick Launch, our new search experience is faster and more effective. Now, search results appear dynamically as you type. And, search results can often include keyboard shortcuts for commands, so that you can more easily memorise them for future use. The new fuzzy search logic will find anything you need, regardless of typos. So, whether you're looking for commands, settings, documentation, or other useful things, the new search feature makes it easier to find what you're looking for. New C# refactorings make it easier to organise your code. Simply invoke the refactorings by pressing Ctrl+. and selecting the action you want to take. We've added many new refactorings, including one that lets you wrap method parameters. Visual Studio IntelliCode is an extension that enhances your software development efforts by using artificial intelligence (AI). IntelliCode trains across 2,000 open-source projects on GitHub—each with over 100 stars—to generate its recommendations. 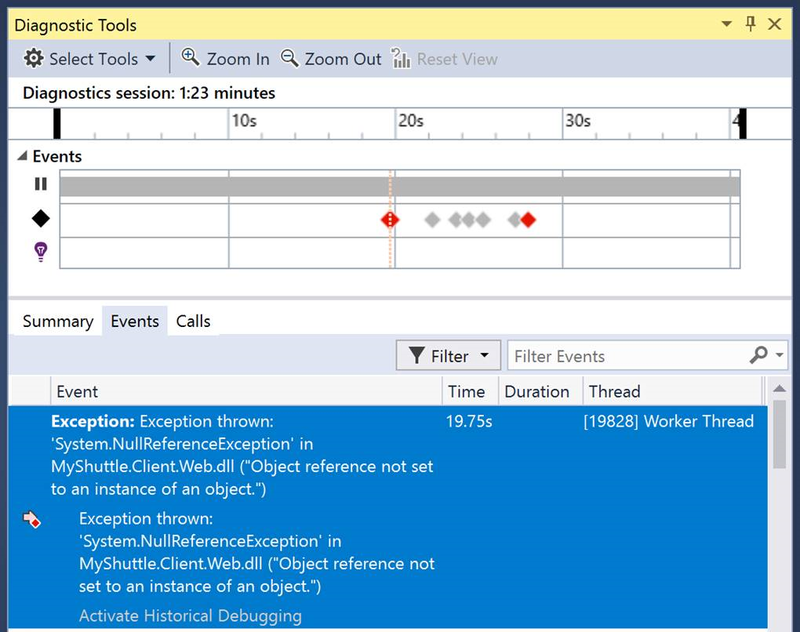 We initially supported only C# when we first previewed the IntelliCode extension for Visual Studio. 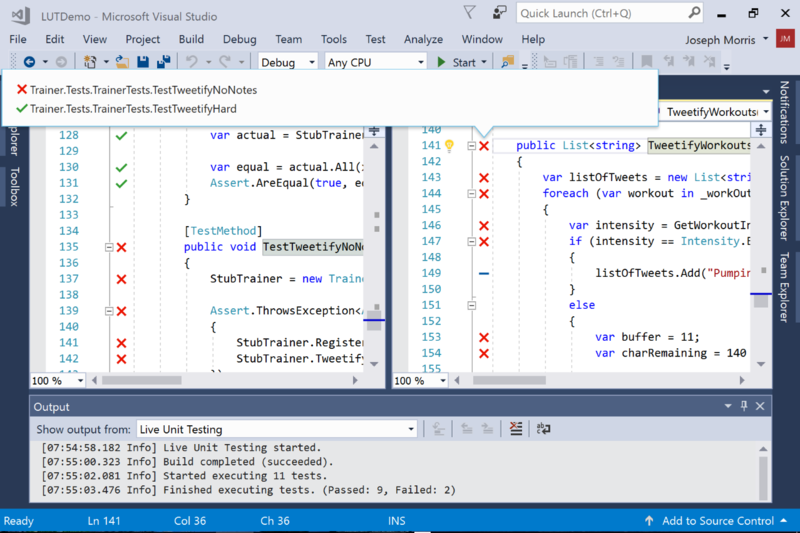 Now, we've added support for C++ and XAML in Visual Studio, too. And if you're using C#, we've also added the ability to train a custom model on your own code. Paired with a new document health indicator is a new code cleanup command. You can use this new command to identify and then fix both warnings and suggestions with the click of a button. The cleanup will format the code and apply any code fixes as suggested by the current settings, .editorconfig files, or Roslyn analysers. You can also save collections of fixers as a profile. For example, if you have a small set of targeted fixers that you apply frequently while you code, and then you have another comprehensive set of fixers to apply before a code review, you can configure profiles to address these different tasks. Team up to solve issues. Something you'll notice when you open Visual Studio 2019 is its new start window. 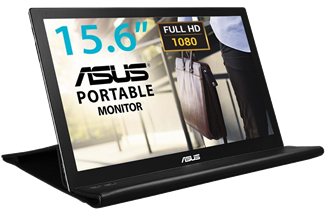 The start window presents you with several options to get you to code quickly. We've placed the option to clone or check out code from a repo, first. The start window also includes options to open a project or solution, open a local folder, or create a new project. 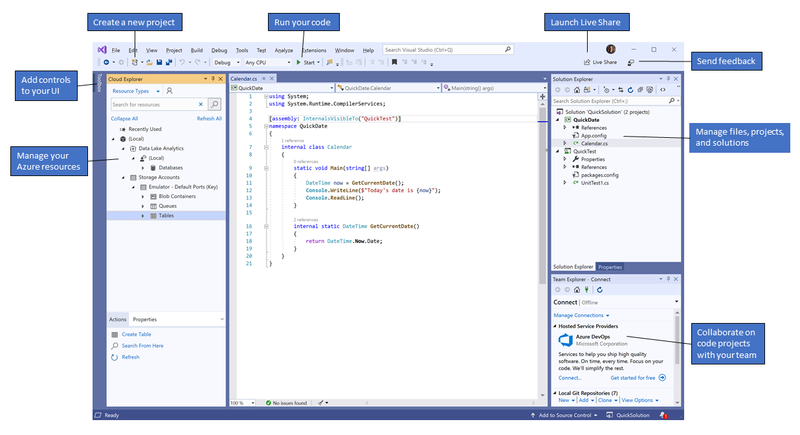 Visual Studio Live Share is a developer service that allows you to share a codebase and its context with a teammate and get instant bidirectional collaboration directly from within Visual Studio. With Live Share, a teammate can read, navigate, edit, and debug a project that you've shared with them, and do so seamlessly and securely. And with Visual Studio 2019, this service is installed by default. We're introducing a new extension that you can download to use with Visual Studio 2019. With this new extension, you can review, run, and even debug pull requests from your team without leaving Visual Studio. We support code in both GitHub and Azure DevOps repositories. Zero in with precise targeting. We've taken the once-exclusive C++ data breakpoints and adapted them for .NET Core applications. So whether you're coding in C++ or .NET Core, data breakpoints can be a good alternative to just placing regular breakpoints. Data breakpoints are also great for scenarios such as finding where a global object is being modified or being added or removed from a list. And, if you're a C++ developer who develops large applications, Visual Studio 2019 has made symbols out of proc, which allows you to debug those applications without experiencing memory-related issues. You've probably been there before, looking in the Watch window for a string amongst a set of values. In Visual Studio 2019, we've added search in the Watch, Locals, and Autos windows to help you find the objects and values you're looking for. You can also format how a value is displayed within the Watch, Locals, and Autos windows. Double-click one of the items in any of the windows and add a comma (",") to access the drop-down list of possible format specifiers, each of which includes a description of its intended effect. We've added support for targeting ASP.NET (Core and desktop) applications that run on an Azure VM. And, we've added support for applications that run in an Azure Kubernetes Service. The Snapshot Debugger can help you dramatically reduce the time it takes to resolve issues that occur in production environments. An integrated, end-to-end solution for teams of any size with demanding quality and scale needs. Visual Studio Enterprise includes Visual Studio for Mac. 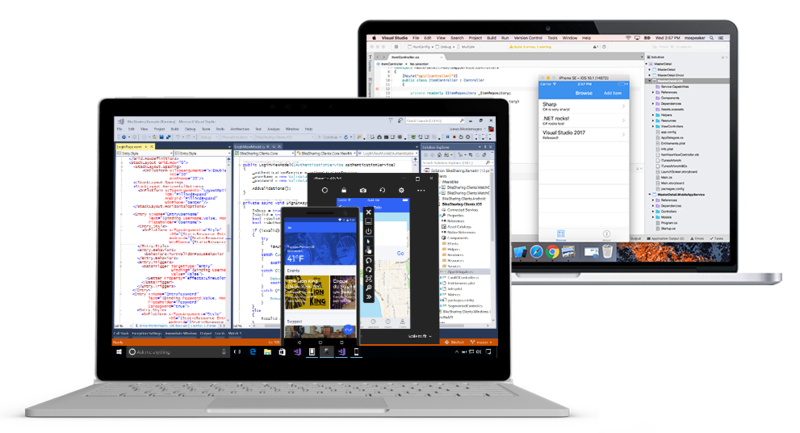 The same experience you know and love from Visual Studio, meticulously crafted and optimised for Mac. Build modern web apps or 5-star mobile apps using enterprise-grade tools, faster and easier than ever before, on Windows or Mac. Delivering modern apps need modern development practices. Embrace modern development practices and deliver code with quality, accuracy, and speed. Spend more time coding and not debugging by infusing code quality right from the first line, directly in the IDE. Modernise your development process and manage the entire software development lifecycle with Azure DevOps. Get a complete DevOps toolchain, from agile planning, source code control to a fully automated CI/CD pipelines and test automation in a single solution to deploy any app on any platform. Spend more time delivering value to your users instead of maintaining your tool-set. Fix bugs faster by quickly identifying root cause of issues with advanced debugging and diagnostic tools whether you are working on desktop, web, cloud, or mobile apps. Innovating at the speed of light requires testing to happen as early and often as possible. Visual Studio Enterprise includes automated and manual testing tools that simplify testing and help teams ensure continuous quality. 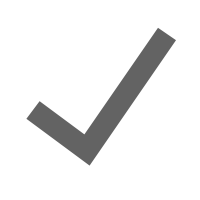 Manual Testing and Exploratory Testing – simplify testing and gather feedback from manual testers, stakeholders, UAT users, etc. Every team's needs are unique. Visual Studio Enterprise enables you to easily tailor your tool chain with included Microsoft extensions for Azure DevOps. You can also further extend your toolchain with exclusive promotions and offers from our partners. In this new world of continuous innovation powered by software, developers are at the core of innovation. Get access to world-class technical training and learning benefits to stay on top of the latest trends and technologies. Learn the skills you need to master any challenge. What do you want to build next? Recommendation engine infused with Machine Learning? Modern, cloud-native apps using containers and micro services? Blockchain? With an Azure credit every month, experiment with different Azure services from Virtual Machines, Websites, SQL Databases to Mobile Services and many more. Experiment and learn how Azure makes it easier to build and manage any apps faster, using the skills you already have and the technologies you already know. Visual Studio 2019 with MSDN comes with VS2017, VS2015 and all older versions. Older versions of SQL Server, Windows Server and other Microsoft products are available upon request. Contact MicroWay for details.